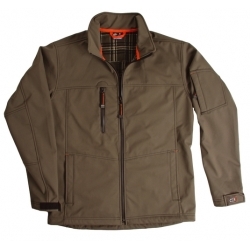 Water repellent jacket in a three-layer soft shell ripstop with good breathability. The ripstop creates an extra strong quality that prevents tears and minimizes damage from holes and is still soft and comfortable. An extra detail is the printed pattern on the fleece inside the jacket. Water tight zipper. On the inside is a pocket and cell phone pocket. There is a removable key band in the right pocket. Fabric: Softshell/ripstop, printed fleece inner, 85% polyester/15% polyuretane, 285g/m².